In the corner of the galaxy I occupied (approaching the singularity of a black hole) only hours had passed, while back here on earth it has strangely been a couple of months. Wierd I know. And, since then many important things have happened here including Annabelle's 2nd birthday, Thanksgiving, and Christmas too. Believe me, If it weren't for this whole space/time differential thing I would have written about all of those things. But, hey when you soar with the eagles, sometimes you travel too close to Saturn. Anyway, I hope to be back to posting a bit more regularly now that the new year is upon us. I kinda owe it to you all after all. Many of you took the time to vote for me in the recent Best of Western Washington contest for best Parenting Blog. Amazingly, I came in in 4th place in that contest and am extremely thankful for all the support. As you can imagine. there is a LOT keeping us busy here. Having 2 small children while leaving my mid 40's in the rearview is surprisingly taxing. Who'd a thought that? One thing that has keep us occupied over the past couple of weeks, besides the holiday's has been Scootering. Yes, scootering. Annabelle, who was determined to ride Lukas' razor scooter for the longest time, recieived her own three wheeled version( a Tri-Fly) for her birthday from her grandparents, and has literally taken off on it. 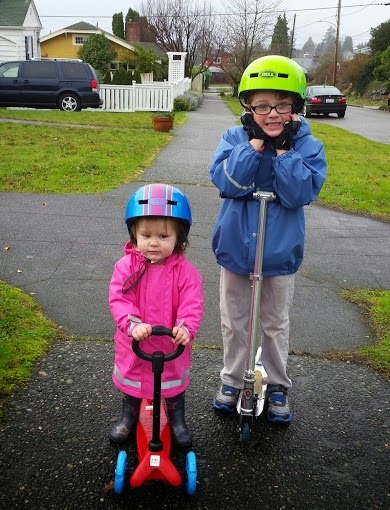 After a few trial runs and words of advice from her older brother, she has mastered kicking the ground for speed, stepping her back foot on the brake, and also turning corners. She has even started doing tricks - holding one leg out to the side while coasting. It is pretty amazing to watch her ride around sidewalks, underground building tunnels, and empty parking lots on her new mode of transport. And she has turned more than a few heads along the way too, drawing many smiles and shakes of the head with how adept she is at such a young age. Pretty soon, she may even join Lukas at the local skate park, going up and down ramps and over jumps. Okay, maybe the jumps are a couple of years off, but I wouldn't put anything past her at this point. Soon, I may have to get my own adult sized scooter just to keep up. * Any similarity to ther to the plot of the cool new sci fi blockbuster Intersellar is purely coincidence.